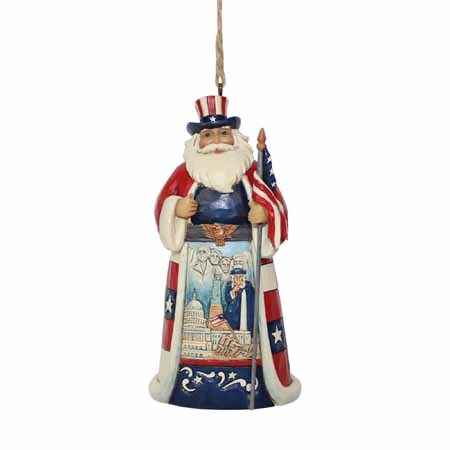 American Santa | Jim Shore Ornaments Figurines | One Price Low Flat Shipping! From the Jim Shore Heartwood Creek Around the World Santa Collection, American Santa Ornament. Made of hand-painted stone resin. Measures 4.5" tall. Comes with hanging cord attached and packaged in collectible Enesco Jim Shore gift box. 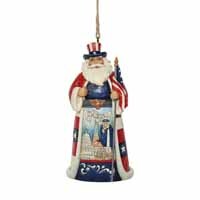 This patriotic Santa Claus is wearing an Uncle Sam styled top hat, holding the American flag, and has etched on the front famous U.S. monuments Mount Rushmore, Statue of Liberty, Capitol building, and more.